Our Master Series event offers participants the opportunity to concentrate on one area of study over the course of the event. Small class sizes, dedicated instructors, and comfortable accommodations set the scene for personal one-on-one attention where the student can immerse themselves in their topic of choice. This course is a true “Master Class”. Thirteen individual conducting students will work one-on-one with master conductor, Dr. William Payn. Each will be assigned one piece to learn and conduct under Dr. Payn’s tutelage. Participating conducting students will form the choir that each will lead. New this year to the application process for conducting students: All conducting students will be required to provide a link to a video of them conducting. The video should show a full body view (head to toe) of the applicant facing the camera while conducting two selections of contrasting styles. This course provides composers of all levels the opportunity to work one-on-one with master composer, Sondra Tucker. Participants will complete a new composition (or one already in the works) during the course and have the opportunity to hear it played by a local choir of volunteers. Both one-on-one instruction and group discussion are included in the schedule for this course. THIS OPTION HAS BEEN CANCELLED FOR 2015. ALL OTHER CLASSES ARE STILL AVAILABLE. 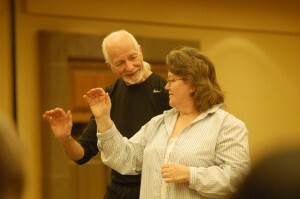 Led by William & Carolynne Mathis, this course is a comprehensive overview of everything any handbell director needs to be successful. Whether you are brand new to handbells, a ringer who now finds themselves holding the baton, or are currently directing a choir, you will benefit from this course. Review a variety of topics including how to teach proper ringing techniques, score study, selecting repertoire for your choir, planning a worship service, motivating ringers, teaching a piece of music from beginning to end, and basic conducting technique. Complete levels one and two of the Handbell Musician Certification courses for Handbell Techniques and Music Theory in one weekend. 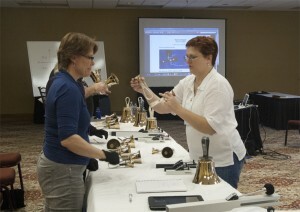 Work with expert handbell musician, Michele Sharik, to complete two levels of Handbell Techniques from our Handbell Musician Certification program. Whether you are a beginning ringer or have several years of experience, you will learn something new in this course. Michele approaches her instruction with an emphasis on optimal ergonomics and sound production. Under the tutelage of Michael Glasgow, students will complete levels one and two of Music Theory required for certification. Some basic understanding of music theory is required before attending this course. Michael creates a fun and energetic environment in his teaching approach. Both courses will allow for individual as well as group instruction. Those who would like this course to count toward Handbell Musician Certification must also register for the certification program. Details are available here. In order to expand the Handbell Musician Certification program, we are seeking persons to become accredited faculty and teach Level 1 courses in Music Theory, Handbell Techniques, and Conducting. Ideally, these new faculty members will be located in different areas of the country to minimize the cost to Areas and local organizations of offering Certification classes, but geographic location will not be considered in accrediting new faculty. The names and contact information for accredited faculty members will be posted on the Handbell Musicians of America website for Area leaders and local organizations to access. 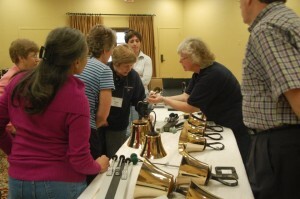 See complete details about the Handbell Musician Certification program and Faculty Accreditation here. There is a $50 non-refundable fee to apply for faculty accreditation. This fee will be applied toward your training registration fee if you are accepted. The 2015 training will be held in conjunction with the Master Series in Cincinnati, OH January 23-26, 2015. Training for Music Theory and Handbell Techniques will be offered on Friday, January 23 and Saturday, January 24. Training for Conducting will be offered from Saturday, January 24 through Monday, January 26. Applications must be completed and received by October 1, 2014. You will be notified of your status by November 1, 2014. This includes a comprehensive application, video presentation, and three recommendations from references that have observed the applicant teaching within the past two years. There is a limit of 6 attendees for each faculty accreditation training class. The results of the faculty accreditation training will be provided by February 15, 2015. The registration fee includes some lunches, but travel to/from faculty accreditation training, as well as lodging, other meals and incidental expenses are the responsibility of the applicant. The registration fee will be assessed only after you have been accepted for faculty accreditation training. These fees do not include the additional fee to receive the teaching materials. That additional fee will not exceed $150 per course, and is only required of successfully accredited faculty. Following is a preliminary, over-all schedule for the event and is subject to change. Detailed course schedules will be provided to attendees following the registration deadline. Located just one half mile from the Greater Cincinnati International Airport (CVG) and featuring complimentary airport shuttle and parking, our hotel is just minutes from casinos, Perfect North Slopes, the Creation Museum, and downtown Cincinnati. At the center of our hotel is the Marriott Greatroom; flexible seating and spaces with a contemporary style and design, a coffee bar proudly serving Starbucks® coffee, and a chef-crafted menu of small plates and pours. We have secured a special rate for attendees of Master Series. To make reservations follow this link or call 1-888-236-2427 and request the rate for Handbell Musicians. All reservations must be made by January 8, 2015, to guarantee our special rate. The Cincinnati Airport Marriott offers free shuttle service from the Greater Cincinnati International Airport (CVG). Call for complimentary shuttle pickup from courtesy phone in baggage claim area or call 859-586-0166 direct for assistance.